If you’ve visited Paris’s chic Saint-Germain-des-Pres neighborhood—and in particular either of the district’s historic cafes, Les Deux Magots or Café Flore—you’ve undoubtedly at least seen the Eglise de Saint-Germain-des-Pres. In fact, if you choose a seat on Les Deux Magots’ side terrace, you’re afforded a fantastic view of the ancient house of worship and its stately bell tower, the oldest such tower in Paris and one of the oldest in all of France. 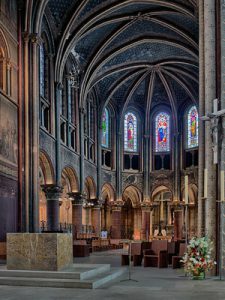 It was this very church—originally founded in the mid-6th century as a Benedictine abbey—that gave the name to Paris’s Saint-Germain-des-Pres district as the abbey for centuries owned all of the Left Bank land in the area. Sadly, though, few tourists do more than admire the scenery while sipping their coffees at the adjacent cafes or perhaps take a photo or two. And that’s a shame, because the church itself is well worth a visit if nothing other than for its rich history deeply intertwined with France’s Merovingian kings who ruled the nation for 300 years beginning in the middle of the 5th century. The church was founded by King Childebert I, who ruled what was then called Francia from 511 to 558. Childebert had led a military invasion of the Spanish city of Saragossa (today known as Zaragoza) in the year 542. Childebert was so moved when he learned that the city’s residents had placed themselves wholly under the spiritual protection of martyr Saint Vincent of Saragossa that he spared the city in recognition of the citizenry’s piety. In thanks, the bishop of Saragossa presented Saint Vincent’s robe and a piece of the “true cross” to the French king. 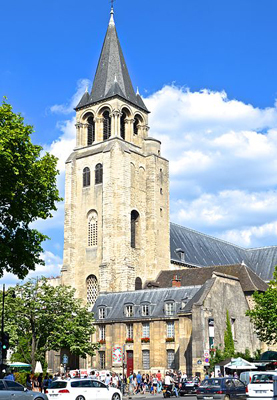 Bishop of Paris Germain (sometimes called by the Latin name Germanus) urged the French king to build an abbey and church to house the newly acquired religious relics, and construction began almost immediately. At the time, the abbey was located well outside of the city’s fortified walls in a meadow—or a pres in French. As such, it was named Saint-Vincent-des-Pres (Saint Vincent of the Meadows). The abbey was completed and dedicated in December 558, ironically on the very day King Childebert died. Two hundred years later, Germain was canonized and his remains, which had initially been interred in a vestibule chapel, were moved into the main church. The house of worship was rededicated in his name in the year 1163 by Pope Alexander III. But it’s not just Germain’s tomb that is of historical interest at Eglise de Saint-Germain-des-Pres: Most of France’s Merovingian kings are buried or memorialized here, including kings Childebert, Chilperic, Clothar II, Chilperic II and Childeric I, as well Bilichild, Childeric II’s wife; Fredeguna, the queen consort of Chilperic I; and Bertrude, the queen consort of Chlothar II. Other historical figures buried at Eglise de Saint-Germain-des-Pres include John II Casimir Vasa, the king of Poland (although today, only his heart remains in Paris, the rest of his remains were moved to Krakow, Poland); William Egon of Furstenberg, a German count and later the Prince of Furstenberg-Heilgenberg in the Holy Roman Empire; Scottish nobleman George Douglas, the first earl of Dumbarton; Lord James Douglas, a Scottish nobleman and the son of the first marquess of Douglas; William Douglas, the 10th earl of Angus and a direct descendent of England’s King James I; French physician and inventor Jacques Barbeu-Dubourg; French philosopher Rene Descartes; and French poet Nicolas Boileau-Despreaux. 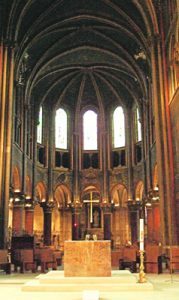 After its dedication in the mid-6th century, Saint-Vincent-des-Pres/Saint-Germain-des-Pres had a turbulent and sometimes violent history. The abbey was frequently plundered by invading Normans, and was completely destroyed when Norman raiders set it ablaze in the 9th century. 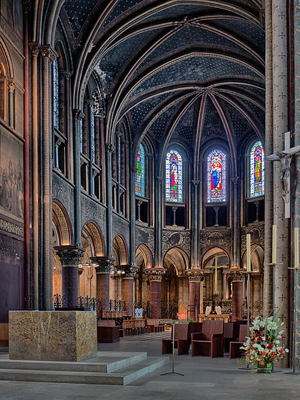 Rebuilt in the early 11th century, the church became an important—and a very wealthy—hub of intellectual life in the French Catholic Church and remained home to a thriving academic community for hundreds of years. During the French Revolution, however, when most of the city’s churches were abandoned, Saint-Germain-des-Pres was similarly dissolved. A significant portion of the church’s interior also was by anti-monarchists, including eight ornate columns that represented the nation’s Merovingian kings. Many religious buildings were turned into secular facilities during the French Revolution, and this was certainly true of Saint-Germain-des-Pres, which was used to store saltpeter, a major component of gunpowder. An explosion of the saltpeter in the late 1700s levelled the abbey and its cloisters, and caused significant damage to the church. To add insult to injury, a fire that broke out in 1794 destroyed the abbey’s library. 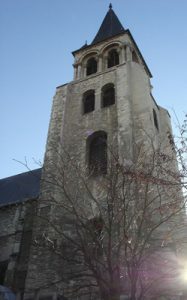 Of the abbey’s once-extensive structures and lands, only the partially ruined church survived the centuries of plunder and the ravages of the French Revolution. A major restoration project launched in the 19th century, and helmed by architect Victor Baltard and painter Jean-Hippolyte Flandrin, resulted in the majestic structure that still exists today. The church is located at 3 Place Saint-Germain-des-Pres (Metro: Saint-Germain-des-Pres). It is free to visit and open daily from 9 a.m. to 7:45 p.m. A visitor’s information desk is accessible Monday from 3 p.m. to 6 p.m., and Tuesday-Friday from 10:30 a.m. to noon and 3 p.m. to 6 p.m. Catholic mass is held at the church Monday-Saturday at 12:15 and 7 p.m., and Sunday at 9 a.m., 11 a.m., 5 p.m. and 7 p.m. This entry was posted in Beauty of Paris, Churches, French history, French Revolution, Left Bank, Religion, Royalty, Saint Germain des Pres and tagged Bishop Germain, Cafe Flore, Eglise de Saint-Germain-des-Pres, France’s Merovingian kings, Jacques Barbeu-Dubourg, King Childebert I, Les Deux Magots, Nicolas Boileau-Despreaux, Rene Descartes, Saint Germain by Bob Adams. Bookmark the permalink.